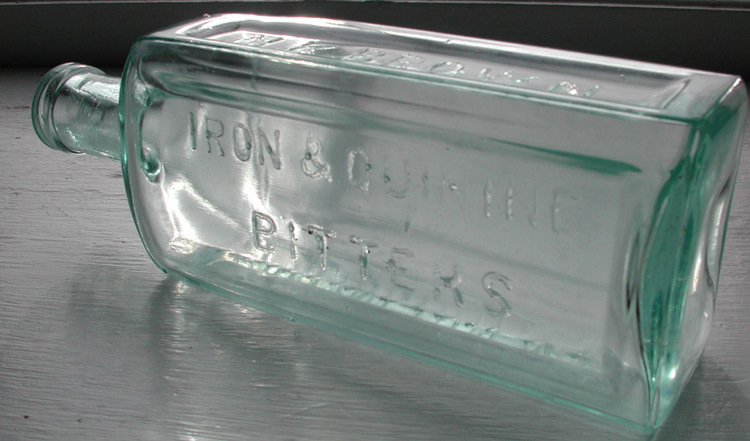 Description: This early bitters for dyspepsia, indigestion, general debility, fever and ague was prepared by N. K. Brown & Co. of Burlington, Vermont. Nathaniel K. Brown was the successor to Fred Smith of Montpelier, Vermont. They produced Smith’s Anodyne Cough Drops with great success. Nathaniel Brown also produced Brown’s Teething Cordial, Star Broches, Bronchial Elixir, Fluid Extract Buchu among others ( compliments Peachridgeglass.com). There are (2) sizes listed in Carlyn Ring and W.C. Ham Bitters Bottle Book both are listed as Rare. This is the 50 cents a bottle size. Rectangular, aqua, applied mouth and tooled lip c. 1880. Few spots of light haze. Note, interesting patterned font style- embossing.